A monkey from Belfast Zoo that was spotted "casually sauntering down the street" has died after being hit by a car on a motorway. The male spider monkey escaped the zoo on Saturday evening. 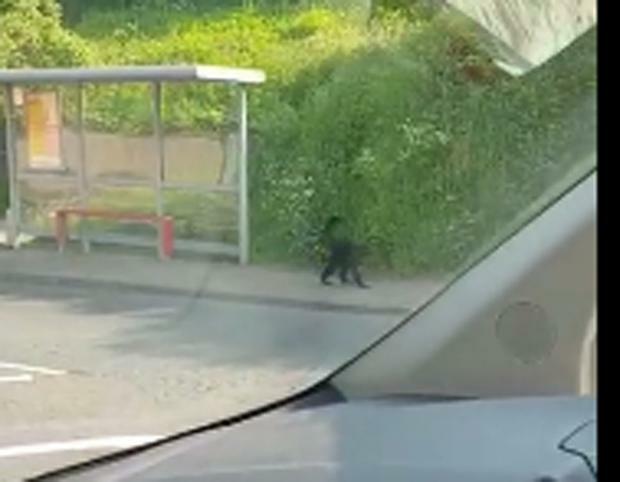 A video of the monkey at a bus stop on the Antrim Road was posted on social media. The zoo is investigating how the monkey escaped. A spokesperson for Belfast City Council: "We are sorry to announced that a spider monkey, which escaped from Belfast Zoo on Saturday night has died. "We are currently investigating how the escape occurred from the monkey island which the animals are kept. "The monkey was being tracked by keepers when the accident occurred and despite being quickly taken back to the Zoo for veterinary assistance died shortly afterwards." The council said staff at the zoo were devastated by the loss. The spokesman added: "We want to thank the PSNI and members of the public for their assistance." Deborah Mccann, whose partner Darren took the video on his phone, said the couple were sad to hear of the monkey's fate. She told the Belfast Telegraph: "It's so sad. I uploaded if for a laugh, it is not every day you see a monkey on the road. My partner felt awful when we found out he had died. "Darren and his brother contacted the Zoo immediately but there was no answer so they contacted the police to inform them." Alliance councillor Michael Long said the housing of animals at the zoo needs urgently reviewed following the incident. “Belfast City Council has a duty of care to look after all the animals at Belfast Zoo,” said councillor Long. “Therefore, a review of security in relation to the housing of animals at the zoo needs carried out urgently, particularly as monkeys have previously escaped from there in the past few years.